I have a notebook brimming full of ideas for things I want to bake. In there, you will find lots of different bundt cake recipes- I seem to be slightly obsessed with anything beautifully round. This year I’ve added a collection of ideas for wreaths; you name it, it’s in there. From plaited bread wreaths with an oozy pot of camembert perched in the middle to plump little balls of Pan Au Chocolat nestled around a pot of melted white chocolate. 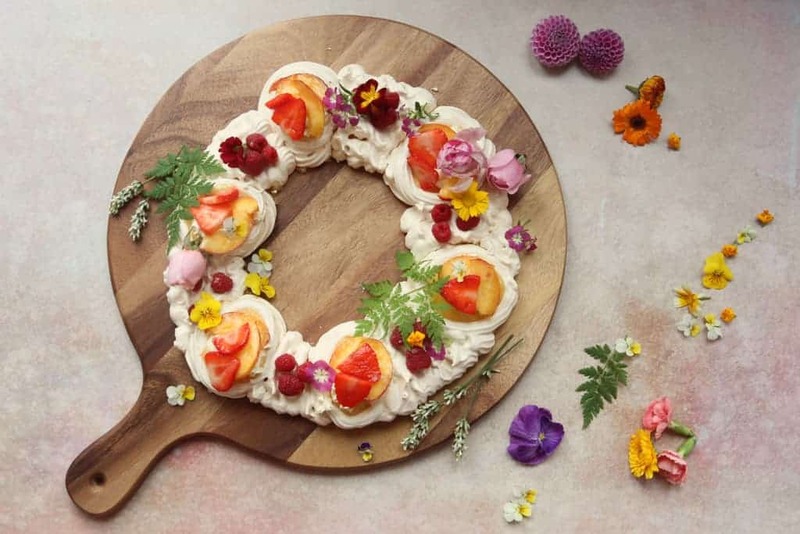 First up though is this beautiful meringue wreath with nests full of tangy lemon curd, topped with whipped cream, fruit and the most gorgeous seasonal edible flowers. I have a thing about edible flowers! They are one of my favourite ways to make a bake look super pretty, and I love the look on my guest’s faces when I tell them that they can eat everything on their plates, flowers and all. Some indulge, most don’t but either way there is nothing more beautiful than something you’ve created covered in delicate flowers and I could spend hours photographing them before they get gobbled up. Preheat the oven to 120°C/Gas mark 1/4-1/2. Take some non-stick baking paper and draw around something circular to make a template, a dinner plate is just the right size. Using a teacup or similar, draw 6 circles around the edge of the circle you’ve just drawn. Wipe the inside of a mixing bowl with a lemon wedge. Add egg whites to the mixing bowl and whisk until soft peaks form. Add the caster sugar a tablespoon at a time until the mixture is firm. Tip: you will know the meringue mixture is ready if it doesn’t feel grainy when you rub a little bit between your fingers. Transfer the mixture to a piping bag. I fitted mine with a star nozzle but it doesn’t really matter what nozzle you use, unless of course your piping skills are much better than mine and you want to do something very decorative! Pipe the circles first, these are your nests. Add an extra layer on the outer edge of the nests which will create a nice border for when you add the lemon curd later. Next, you need to fill the gaps in-between the nests. Bake in the oven at 120°C/Gas mark 1/4-1/2 for 2 hours. Tip: Your meringue is ready when it is crisp and hard to the touch, check it underneath by lifting one edge very gently. If the meringue is still gooey increase the cooking time in 5-minute increments until it’s dry to the touch. Once cooked, leave the meringue in the oven until the oven has completely cooled down. When cool, remove from the oven and peel away the baking paper. Tip: At this stage, make sure the meringue is completely cool before you attempt to peel off the baking paper. Do this step too early and your meringue will crack and break up. Fill each nest with lemon curd and top with whipped cream and fruit. 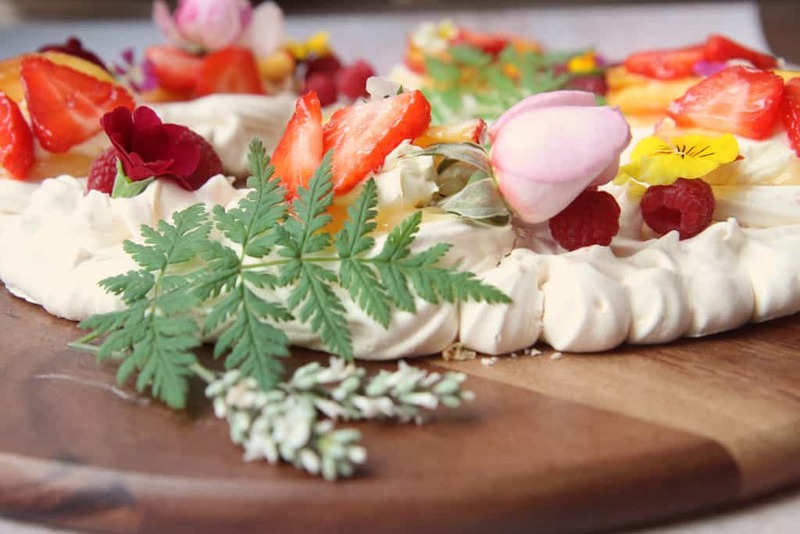 Finally, decorate with edible flowers to your heart’s content. Enjoy the looks on your guest’s faces when they see your masterpiece! Using a teacup or similar, draw 6 circles around the edge of the circle you've just drawn. Add the caster sugar a tablespoon at a time until the mixture is firm. Tip: you will know the meringue mixture is ready if it doesn't feel grainy when you rub a little bit between your fingers. Transfer the mixture to a piping bag. I fitted mine with a star nozzle but it doesn't really matter what nozzle you use, unless of course your piping skills are much better than mine and you want to do something very decorative! Bake in the oven at 120°C/Gas mark 1/4-1/2 for 2 hours. 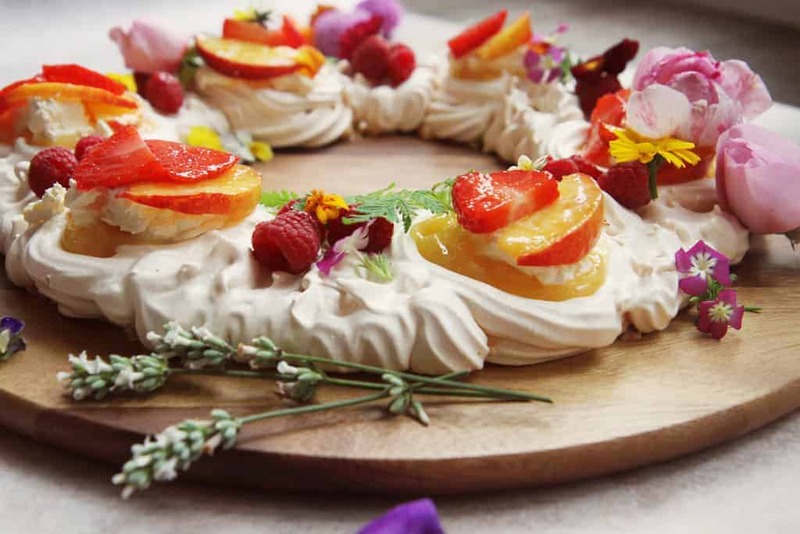 Tip: Your meringue is ready when it is crisp and hard to the touch, check it underneath by lifting one edge very gently. If the meringue is still gooey increase the cooking time in 5-minute increments until it's dry to the touch. Fill each nest with lemon curd and top with whipped cream and fruit. Finally, decorate with edible flowers to your heart's content. Once cooked, leave the meringue in the oven until the oven has completely cooled down. When cool, remove from the oven and peel away the baking paper. Tip: At this stage, make sure the meringue is completely cool before you attempt to peel off the baking paper. Do this step too early and your meringue will crack and break up. Enjoy the looks on your guest's faces when they see your masterpiece! Las mejores frases de amor de Pablo Neruda. Piping meringue is so tricky! This looks stunning though, and thank you for the edible flowers tip – I’d never know where to get them from. It can be tricky to pipe but I just cover it over with fruit! And my pleasure, the edible flowers are so gorgeous to use and the box they come in offers plenty of variety! I truly don’t think I have ever seen a prettier dessert. Yummy! This does look really gorgeous! 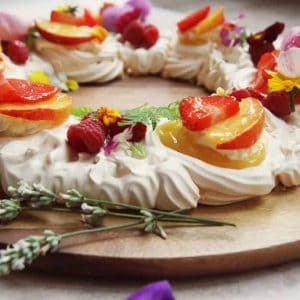 We love meringue in our house and, although I love baking and cooking, I’ve never attempted my own meringues! I don’t think I’ve ever tried edible flowers either but I’m intrigued now! This looks delicious! Alms too good to eat! That looks like a wreath for a May Queen! How pretty, and how fun! The flowers are just right. This is such a gorgeous dessert! 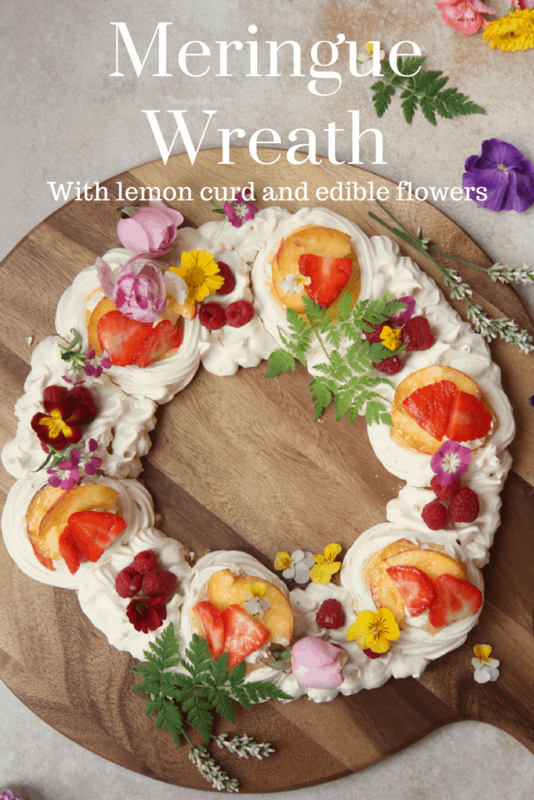 I just love the idea of a meringue wreath! This is SO pretty! I bet it would make a superb party dessert! This is gorgeous! Meringue is something I used to eat a lot as a kid, but it never looked like this. Those flowers add just enough pop of color. Love it! Not only is this beautiful it sounds SO lovely. Lemon curd is one of my absolutely favorite sweet treats. I’m one of those weirdos that likes fruit desserts over chocolate. I’ve made small meringues before but never like this, definitely want to try. This looks too pretty to eat! Just stunning! I find making meringue to be a bit tricky (I blame it on the Florida humidity) so I appreciate your easy to follow instructions! This looks so pretty, almost too good to eat, although I bet I’d make a good attempt at it! Your images look absolutely delicious! I’m a meringue and lemon nut so I have no problem scooping these right up! This reminds me of those cake tarts with numbers that are exploding all over social media! My mom would just love this for Mother’s Day next week! This is gorgeous! It’s almost too pretty to eat, but it sound so delicious too! I bet the lemon curd is lovely with the meringue and the flowers! This is so beautiful. I absolutely love it! I am so excited to make this. It looks so fancy. This is so pretty – your piping skills are for real! And with the lemon curd and flowers, it just screams spring to me!